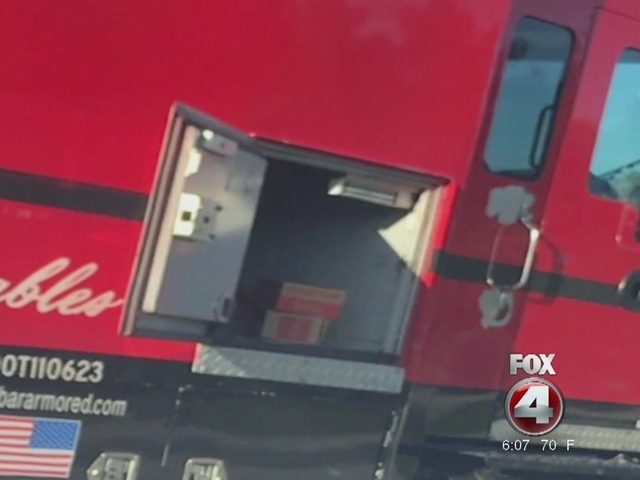 What would you do if you saw money spilling from an armored truck? That's exactly what happened in Fort Myers, Florida Thursday morning. The truck owned by Dunbar Armored Security was driving down U.S. 41 when a side door suddenly popped open, causing money to fall onto the road. Scott Nielson and his wife noticed the money falling out of the truck and that a three foot door on the passenger side was wide open. Concerned they would lose more money, Nielson tried to alert the driver of the truck. "We tried honking our horn, made several attempts waving, tried to show them a picture of their truck with the open door open. But they would not look in the mirror or would not acknowledge us" said Nielson. Once the armored truck turned into a parking lot, Nielson tried to get their attention once again. "He (the driver) put his hands up and wouldn't talk to me, and I was pointing and he still wouldn't talk to me. But there was an individual there that wasn't a part of their company picking the money up in the parking lot that had spilled" said Nielson. News station WFTX in Ft. Myers contacted Dunbar Armored Security and spoke to the Vice President of Marketing. He said they are looking into the incident. Nielson added the company needs to take responsibility for their actions and there is a lessoned to be learned from this. WFTX also reached out to the Sheriff's Office and no one has reported any missing money. They add if you ever find money that is clearly marked, you're obligated to return it or you could face charges.